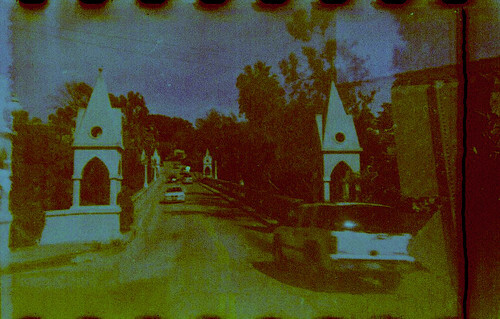 17th April, 2011 © blanket sin – "shakespeare's_bridge083"
I'm still a bit green when it comes to scanning and photoshopping. I got my roll of film this past Friday and was so disappointed at the results. Then I remembered I had to shop the results of the first roll of film I shot with the Instamatic anyway; so no matter how I look at it, there's no getting around the bad quality I get with the camera. The only thing I have to look forward to in taking pictures with it is that, although it's a crapshoot whether or not I'll achieve any clarity, as long as there's daylight, my little vintage camera doesn't need batteries or recharge. This exposure of the Shakespeare Bridge in the Los Feliz area is the best exposure IMO. It looks so bad, what with the redish blemish in the sky, because I'm an amateur with photoshop and film negative scanning. what dpi are you scanning at? Firstly, though very unprofessional, i would like to emphesize I'm drunk. I only say that because I am guessing that you inquired ascot how many Dots per Inch I was scanning. If I am correct, im scanning at 300DPI. That sounds ggos, first it? Did I mention I just got back from a night of heavy drinking? My apologies. It's just that, while I was sipping my beer, or what have you, I wasn't yet feeling the groove that others were showing in their impressive moves. So, of course, I thought the only remedy was MORE ALVOHOL. 300dpi then. I figured that was a good size to fill a page, and still allow for some text. You don't know how much it means to me that you take interest in my dilemma of reviving an old Instamatic camera.